Operation Protective Edge against Hamas in the Gaza Strip ended on 26 August 2014, but two months later the effects of the operation persist. The Israeli operation has caused substantial human, economic, and material losses for the inhabitants of Gaza. 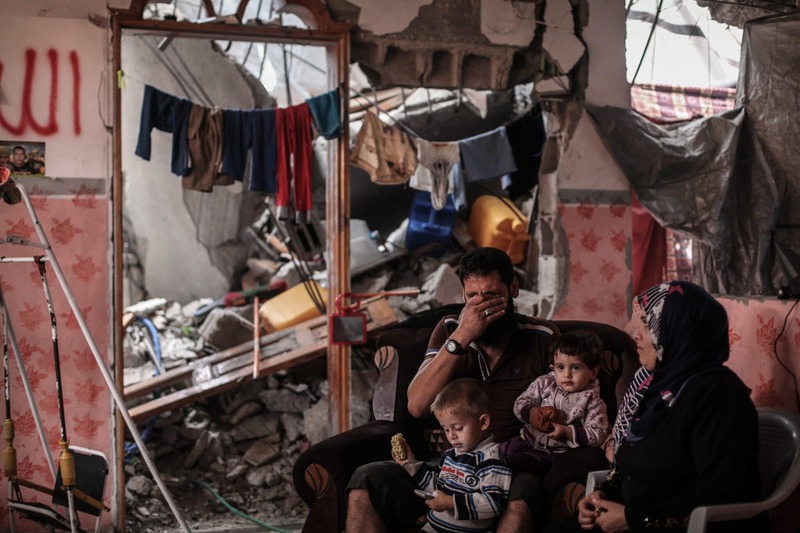 Based on a report published on 4 September 2014 by the Office for the Coordination of Humanitarian Affairs (OCHA) titled “Gaza Crisis”, approximately 18,000 homes have been partially or totally destroyed, making 108,000 Palestinians homeless. Palestinian President Mahmoud Abbas has requested that the donor community offer at least 4 billion dollars for the reconstruction of Gaza. Because of the urgent need to improve the humanitarian situation in Gaza, the Palestinian Authority and other international organizations, especially UNRWA, appealed to the donor community to offer urgent assistance for the aid and reconstruction of Gaza. During an interview with fanack.com, Adnan Abu Hasna, the UNRWA spokesman, stated that the agency had appealed to the donor states for assistance totalling $1.6 billion and that UNRWA is offering assistance to approximately 52,000 internally displaced persons residing in UNRWA schools. 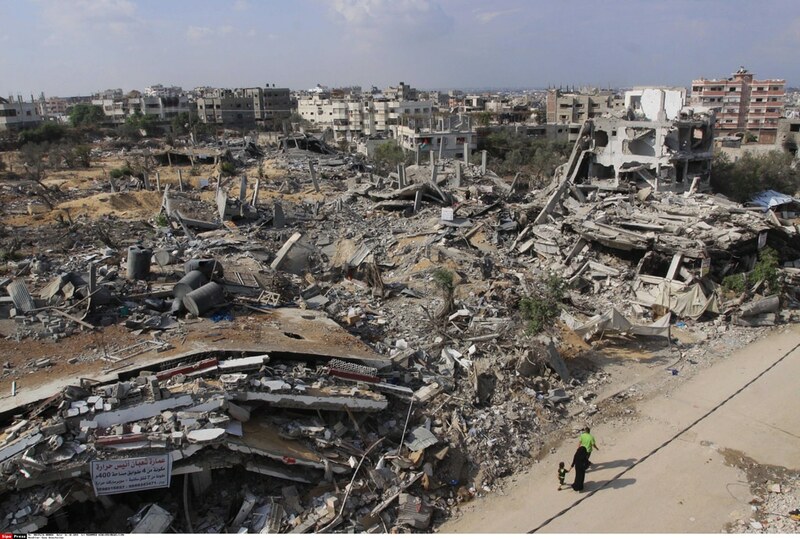 On 12 October 2014, Egypt hosted the Gaza Reconstruction Conference, which included approximately 50 international delegations, 30 foreign ministers, and 20 international and regional organizations. The conference was attended by such international figures as John Kerry, the US Secretary of State; Catherine Ashton, the High Representative of the Union for Foreign Affairs and Security Policy for the European Union; and Ban Ki-moon, the Secretary General of the United Nations. During the conference, Egyptian President Abdel Fattah al-Sisi gave a speech emphasizing that there is no alternative to a fair and full resolution to the Palestinian problem, in which the Palestinian people regain their rights. At the end of the conference, the Palestinians gained international commitments to finance human and construction project in the Gaza Strip. A total of $5.4 billion was pledged by the donor community. Some of the most prominent pledges came from the Gulf states and Western nations. Qatar, through its foreign minister, Khalid al-Attiya, pledged one billion dollars, Kuwait pledged $200 million over the next three years, the UAE pledged $200 million, and Saudi Arabia half a billion dollars. Secretary of State John Kerry stated that the United States will pledge $212 million in additional assistance to the Palestinians. Frank-Walter Steinmeier, the German minister of foreign affairs said that Germany is pledging €50 million (approximately $63 million) and that “it is unacceptable to accept the status quo in Gaza, and no one wants to rebuild a new infrastructure only to see it destroyed after a short while”. Laurent Fabius, the French foreign minister, pledged €30 million (approximately $37.8 million) for projects in Gaza through 2017. Federica Mogherini, Italy’s minister of foreign affairs, announced that Italy will pledge €18.7 million ($22.7 million) immediately for the reconstruction efforts and an additional €30 million ($37.8 million) to be delivered later. Desmond Swayne, Britain’s minister of state for international development, stated that his government is pledging $32 million for Gaza reconstruction. International efforts to speed the process of Gaza reconstruction have led to an agreement among the Palestinian Authority, Israel, and the United Nations, to begin the movement of necessary construction materials through the Kerem Shalom crossing. Israel has put conditions on the shipment of construction materials to the Gaza Strip. Both sides have agreed that all materials entering Gaza will be thoroughly inspected. In October 2014 Israel permitted 1,500 individuals over the age of 60 to travel through the Erez Crossing to pray at al-Aqsa Mosque in Jerusalem during the Eid holidays. Husein al-Sheikh, Head of Civil Affairs for the Palestinian Authority, issued a press release in which he stated that Israel has agreed preliminarily to issue 5,000 permits for Palestinian workers from Gaza. Additionally, Israel is permitting Gaza farmers to export some agricultural products to the West Bank. Israel is following a policy of easing restrictions over Gaza in order to avoid a worsening of the security situation at the Israel-Gaza borders. Still, according to Gaza officials, Israeli authorities on 14 October blocked the export of sweet potatoes and dates from Gaza to the West Bank. Despite international pledges for the reconstruction of Gaza, there are still, as of mid-October 2014, challenges preventing reconstruction. International donors requested that the Palestinians and Israelis reach a stable and permanent truce and the return of the Palestinian Authority to its functions in Gaza. This is to ensure that the Palestinian unity government will be able to carry out its functions in Gaza and at all the crossing points. The donors also requested that the United Nations oversee the disbursement of the funds. This has caused concern among the Palestinians that some funders might withdraw their pledges, because the Palestinian Authority had not taken charge of some of the main crossings by 20 October 2014, and there are still disagreements between the Palestinian Authority and Hamas regarding the transfer of authority from Hamas to the Palestinian Authority. The Palestinian Authority was supposed to take over management of the crossings as of 12 October, after the prime minister’s visit to Gaza, but Maher Abu Sabha, the former director of crossings in the former Hamas government issued media statements that reports that the Palestinian Authority had taken control of the crossings were not true and that no agreement has been reached on the matter. Amaal Hamad, a member of Fatah’s Central Committee, called on Hamas to hand over all authorities and functions to the Palestinian unity government, in order not to delay the reconstruction projects in Gaza. In response, Yahya Mousa, a Hamas leader, stated in an interview with Fanack.com that Hamas has no problems cooperating with the unity government to allow reconstruction to take place but that Hamas rejects any Israeli or international conditions that restrict the movement of Palestinians at the crossings. Egypt refuses to open the borders for the Palestinians, as it insists that the Palestinian presidential guard be in charge of the Rafah border crossing, an issue that remains a source of conflict between the Palestinian Authority and Hamas.